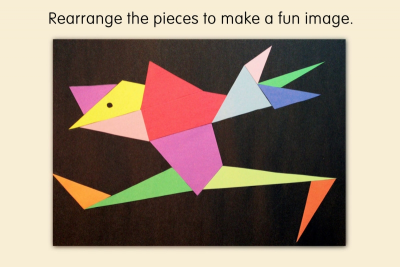 Students follow instructions to draw the 14 pieces of a stomachion puzzle, cut out the shapes in different colours of construction paper, then rearrange the pieces to make fun images. 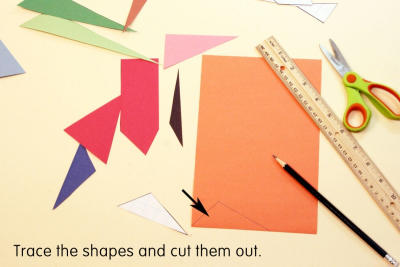 Trace the puzzle pieces onto different colours of construction paper. Rearrange the pieces to make a fun image. Choose a piece of construction paper for your background that contrasts with the colours of your image. Carefully glue the pieces onto the construction paper. figure out what percentage of the possible 536 arrangements the participants have found. Provide some time for students to work with different kinds of puzzles. Teach or review dissection puzzles. 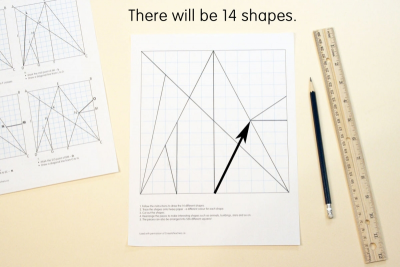 Provide time for students to work with tangrams. Precut construction paper in a variety of colours - 15.2 cm x 22.9 cm (6" x 9"). Ask students to share their favourite tangram solution. Discuss dissection puzzles and what makes them interesting. Explain that a stomachion is like a tangram only more complicated because it has 14 pieces. Follow instructions to draw the 14 pieces of a stomachion puzzle. Use all of the stomachion pieces to create a collage of a fun image. Use contrasting colours to make your image stand out. Once all the images are complete ask students to share them in partners or small groups. - Look closely at the images and how they are made. - Talk about how the shapes have been used differently to create something unique. - Talk about what was difficult about making the puzzle image and explain why. - Tell what was satisfying about making the puzzle and explain why. Display all the images in the classroom so students can view them over the next few weeks. Observe students as they discuss their work – active listening, insightful contributions, supporting ideas with evidence found in the artwork and from personal experience.